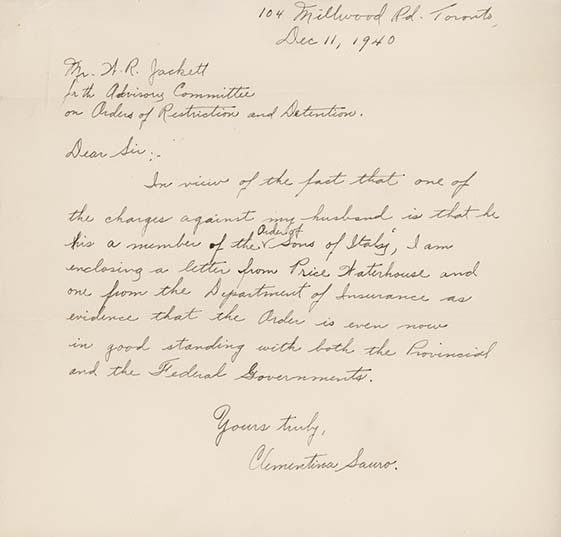 Letter from Clementina Sauro, to W.R. Jackett (Advisory Committee on Orders of Restriction and Detention), December 11, 1940. From his arrest, Clementina was relentless in her mission to have her husband released. She wrote many letters on his behalf, including letters to M.J. Coldwell and J.S. Woodsworth, her husband's colleagues at the United Church, and others. She also hired and worked with lawyers to facilitate Sauro's hearing and work towards his release. As Clementina suggests the evidence against Sauro included his involvement with the Order Sons of Italy. However, this organization does not appear to have been banned by the government and continued its operations during the war (although much reduced). We know that the outcome of the hearing noted in this letter was the unconditional release on December 27, 1940 of Libero Sauro. Recto: [t-b, l-r]: [handwritten in ink] 104 Millwood Rd. Toronto, / Dec 11, 1940 / Mr. W. R. Jackett / for the Advisory Committee / on Orders of Restriction and Detention. / Dear Sir:- / In view of the fact that one of / the charges against my husband is that he / his [h crossed out] a member of the Order of Sons of Italy, I am / enclosing a letter from Price Waterhouse and / one from the Department of Insurance as /evidence that the Order is even now / in good standing with both the Provincial / and the Federal Governments. / Yours truly, / Clementina Sauro.